So, after a long week in the lab, I’ve just had a fantastic weekend! Unfortunately I didn’t make it to the Poynton Ceilidhs calling workshop, but I’m happy to hear that it went very well – and was followed by a sell out ceilidh! The tutors, Rhodri Davies and Martyn Harvey are both fantastic callers, and having been introduced to calling at a similar event in Oxford I know it’s a great opportunity to get into ceilidh calling. So go Poynton! Speaking of which, Cat’s Calling Academy in Oxford (where I first learnt to call), is running another event in February. If you’re in the South and interested in either learning to call or honing your skills I’d definitely give it a go! Anyway, shameless plugs aside, I should get down to the real subject of this blog. This weekend my superhero alter ego was revealed to me…”Non-traditional Ceilidh Woman”. It may not be the *catchiest* of names, but I rather like it :). The name was inspired by a figurine I was given for a board game. It was intended to be a magician’s assistant but was chosen for me because the cards could be calling cards and the other hand might be ‘casting’ ceilidh dances. I spent Sunday morning painting it and tried to get it as close to my normal calling gear as possible. I’m not sure my painting skills are sufficient to really have done my beloved calling jacket justice – but I don’t think I did too badly! B1: “Overconfidence” Heroes RH star 3/4 in middle whilst zombies bounce and kick (x3) then 1/2 LH turn with zombies on side to swap. Zombies RH star 3/4 in middle whilst heroes bounce and kick (x4) and end up in Hero positions. p.s. 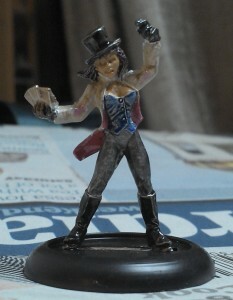 This dance was inspired by the zombie boardgame “Last Night on Earth”, and the figurine was to go with a character sheet with my role being “Cotswold Dancer” and the special ability “can run through a space with only one zombie on it”. Who’d have thought that being a morris dancer would come in so handy in the Zombie Apocalypse?